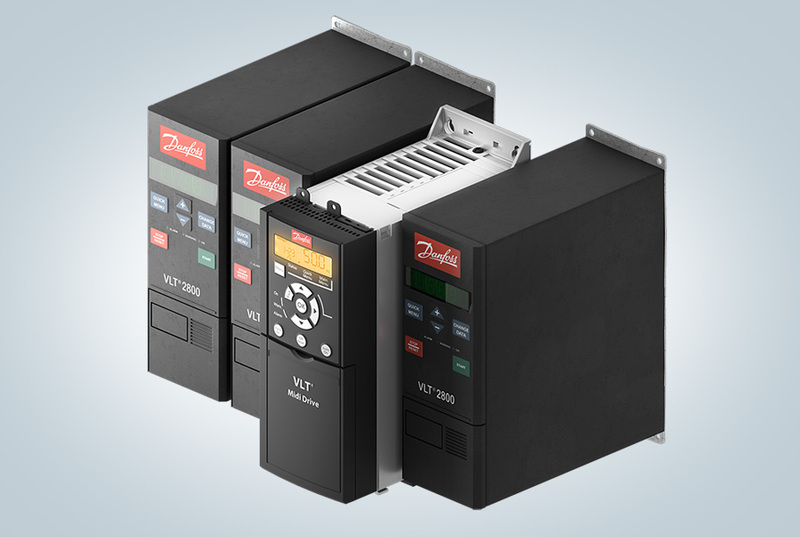 The Danfoss VLT® 2800 has been one of the most popular AC drives in the market; operating successfully for nearly two decades. But, as the expression goes, all good things must come to an end. The last date to purchase a VLT® 2800 is fast approaching, with production halting shortly afterwards. HOWEVER, the great news is that a new, state-of-the-art drive is ready to take its place – the VLT® Midi Drive FC 280. The VLT® Midi Drive is more than just a successor for the VLT® 2800; it is simply the best alternative. Beside the full backwards compatibility, it offers a number of additional functions which makes this new drive flexible, communicative, easy to use and the best fit for your application. The VLT® Midi Drive’s exterior dimensions, connectors, cable lengths and set-up software tools allow you to easily retrofit an established drive panel. Pluggable terminals make this the easiest wiring task imaginable for installation and service – simply plug in and plug out for mains, I/O, fieldbus and motor connections. The structure of the operating software or parameterization is very simple and matches all the other VLT® drive families – if you know one VLT®, you know them all. With integrated harmonics mitigation, RFI filter, brake chopper, industrial fieldbus support and dual-channel STO functional safety, the drive is easy to use and there are no hidden extras. In compliance with IEC/EN 61000-3-12, the integrated DC chokes for all 3-phase units reduce harmonics to less than 48% THDi. As standard in all single-phase units, the unique active power factor correction feature reduces the input current distortion remarkably, to less than 8%. It also ensures safe compliance to the IEC/EN 61000-3-2 standard. The VLT® Midi Drive covers 200V and 400V voltage types and power sizes between 0.37 and 22 kW. A built-in brake chopper for 3-phase drives in the whole power range saves money and panel space. Furthermore, all important fieldbus protocols are supported which simplifies the integration of the drive to process automation control systems. This includes Ethernet-based protocols, such as PROFINET, POWERLINK and Ethernet/IP, and RS485-based protocols like PROFIBUS and CANopen as well as Modbus RTU. The dual channel version of the STO operation complies with the ISO 13849-1 PL d and SIL2 safety levels in accordance with IEC 61508 and IEC 62061. Additional external components that were previously required are no longer necessary, decreasing the cost. The VLT® Midi Drive is designed to be in line with the Ecodesign Directive. It is oriented towards the EN50598 European Standard, which defines the performance classes of motors or motor systems with AC drives. This device qualifies for the IE2 converter classification, which is valid including the radio interference filter that is already integrated as standard. In addition to supporting IE2 and IE3 class three-phase asynchronous motors, it also supports highly efficient PM motors. The integrated USB port as well as the VLT® Memory Module facilitates helpful implementation of factory settings for OEM and machine builders, fast installation of firmware updates, and easy commissioning of drives – a first for VLT® drives. To transfer pre-defined parameter sets, make a backup copy, or commission the drive on-line, simply connect the VLT® Midi Drive to a PC using the handy front-access USB port. Alternatively, connect via fieldbus. Clone a drive by using the VLT® Memory Module or just duplicate the settings using the LCP copy function. Easy parameter set-up makes the path to energy savings both short and simple, using an enhanced numeric LCP or graphical control panel that supports seven languages. Targeted ‘Application Selections’ make it easy for users to set up and commission typical applications. With mechanical dimensions that match or are even smaller than those of the VLT® 2800, the VLT® Midi Drive can easily replace a VLT® 2800 in an existing control cabinet. And, as is standard in VLT® products, the terminal allocation remains the same to the greatest extent possible. For OEMs and system integrators, this means that a new drive can easily be integrated into the existing plant design. With the advanced features of the VLT® Midi Drive, machinery and equipment can now be technically upgraded and even simplified. The VLT® Midi Drive provides precise and efficient motor control for machine builders in the food and beverage, material handling and processing industries. It is strong on control performance, functional safety and flexible fieldbus communication. And the right mix of features ensures this AC drive is ideal for a wide range of applications such as pumps, fans, mixers and compressors and conveyor and packaging systems. You can read more about the VLT® Midi Drive here. And don’t hesitate to contact us if you have any concerns related to the phasing out of VLT® 2800. But, don’t worry; as one successful era draws to a close, the new era in compact, communicative, easy-to-use drives has already started. Switch up to the VLT® Midi Drive FC 280 as soon as possible for ongoing production optimization and maximized energy efficiency.